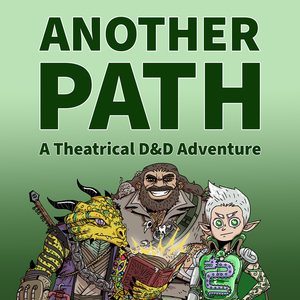 Chase is the host and DM of Another Path. Though this is his first foray into hosting a podcast, he has previously guested on Radio Free Midworld and Being Jim Davis. Chase has hosted 54 Episodes. The Aegis Three (and Salix) take a moment to themselves before finding what lies at the heart of the ruins beneath the mountains. The Aegis Three (and Salix SeBulwark) descend beneath the Lumberton of Ground. Mordecai, Zafiir, Jackson, and Salix end their investigation of Ground and strikeout to save the missing people. Also including breaking, entering, and walking tacos. The Aegis Three continue their investigation of the Lumberton of Ground, and reconnect with each other. The Aegis Three explore the Lumberton of Ground. Mordecai goes for a walk, Zafiir makes a new friend, and class is in session with Mr. Silver. The Aegis Three Vs The Harpies Ten. Mordecai deals with some shocking news, while Zafiir and Jackson remember a bad day. Your benevolent GM/Editor Chase has gotten a new job, which means its time to break one of our "Break glass in case of life event" boxes... Ok, the metaphor breaks down pretty quick. What that means is that you are getting an experimental episode this week while Chase gets his life together. Edited by Zack, run by Ryan, we turn randomly generated characters and opponents alchemy like into a coherent story and good humor. Sit back, relax, and enjoy, The Birds of Prey. The Aegis Three (and Yra) make their way into the depths of an enemy camp, but find more questions than answers. Jackson, Mordecai, Yra and Zafiir return north, to where this potentially all started.